Description: A mousemeter screenbar module. Short: A mousemeter screenbar module. done on your system. It also show the avarage speed. 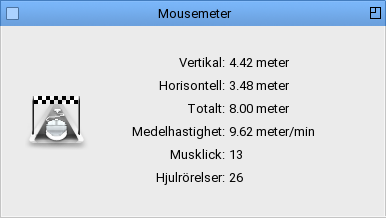 - Fixed that mouse clicks and wheel movements isn't counted doubled or more if you use multiple screens. - Fixed on-the-fly calculations when changing units in the preferences. - Only automatically opens on the current active screen (if the preferences is set) and not all other screens.